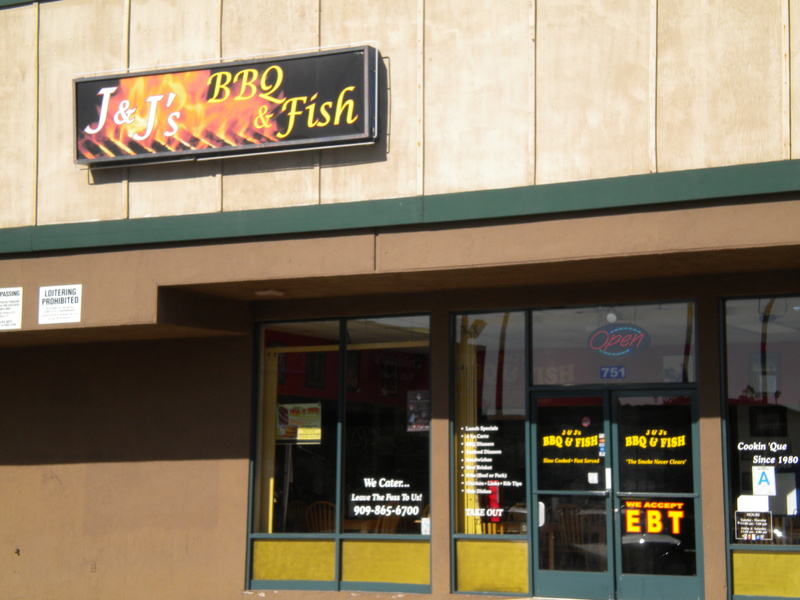 J&J’s opened in 2009 in a downscale strip center just above Holt, where it replaced a Vietnamese bakery. I had a catfish dinner not long after they opened, thought it was okay but didn’t write about it. For one thing, I wondered how long J&J’s would survive; for another, it’s a hard place to knock even if you’re not sold on it. The usually opinionated New Diner gave it a mixed review in 2010. Some three years later, J&J’s has hung in there. When a friend recommended it recently, both for its food and the unusual kindness shown to his elderly mother, I decided to drop in for lunch. The menu has all the usual barbecue specialties and, as the name implies, a variety of fish ready to be fried. 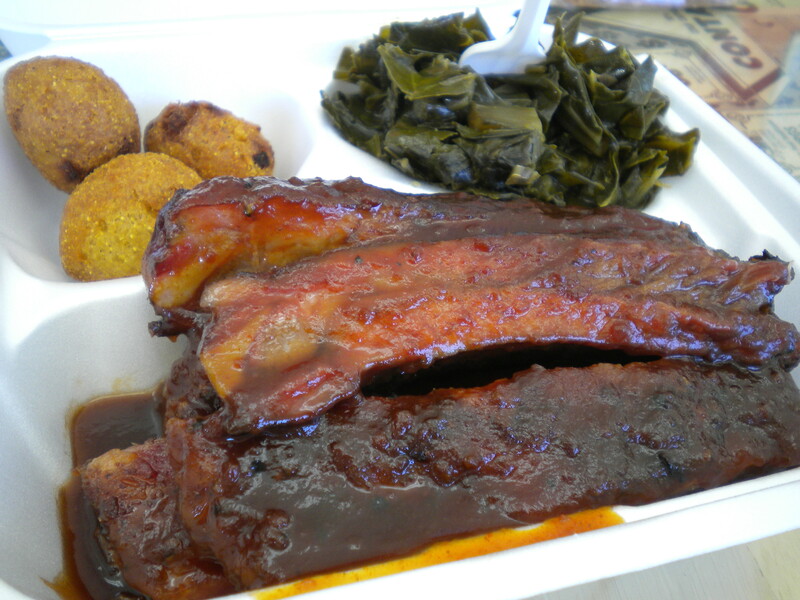 I got the pork rib plate ($9, pictured) with two sides: collard greens and hush puppies. (A larger portion, the dinner, is $12.) The plate had five ribs and was a satisfying size. That said, the ribs, cut St. Louis style, were softer than I like. On the other hand, I ate them all and the sides were good. 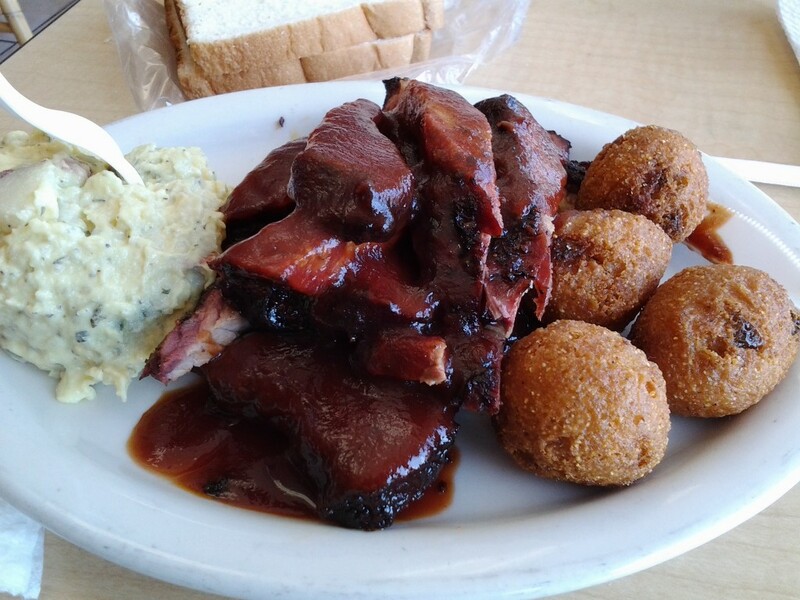 Returning a month later, I got the beef brisket, potato salad and hush puppies ($9, second picture below). Bingo: A delicious heap of smoked meat and an excellent mustardy potato salad. I got a couple of slices of bread to sop up the barbecue sauce. Best barbecue I’d had in months and deeply satisfying. 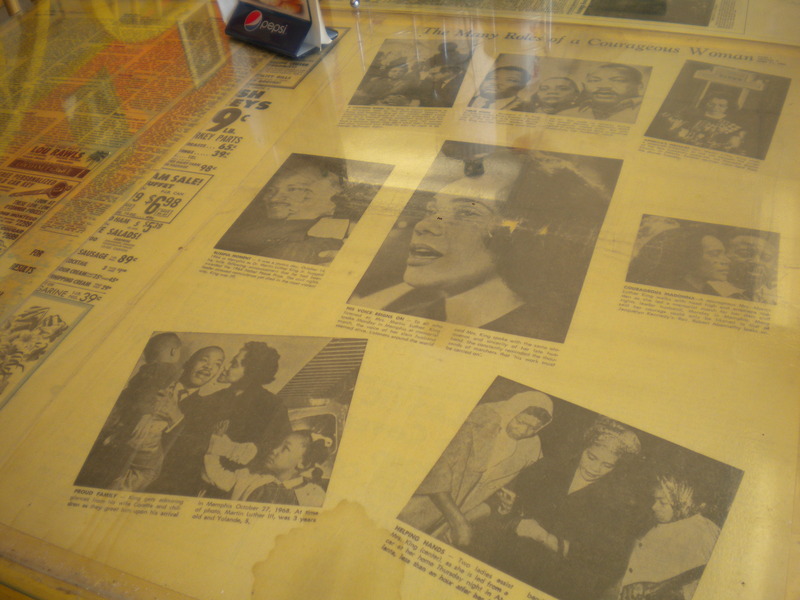 Tables have spindles of paper towels to use as napkins, an old barbecue tradition, and some have tearsheets from black newspapers under the glass, a neat touch (bottom photo). A small statue of James Brown stands next to basketball trophies from a team the owner’s son coaches. It’s a homey place and seems to be a hub for the local black community, as well as barbecue lovers. I hope they keep on keepin’ on. Update January 2016: I eat here often. Sundays they have a Soulful Sunday buffet where there’s more soul food items. They’ve ditched the cool black newspaper clippings, but the food’s still good, and they use plates, not styrofoam now. Here’s a rib plate with collard greens and hush puppies. 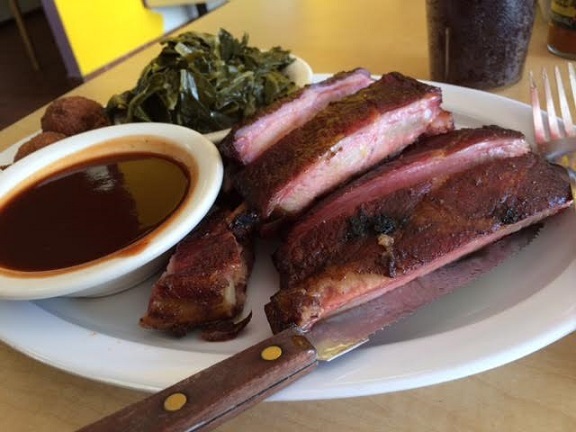 This entry was posted in Restaurants: Pomona and tagged barbecue, Pomona, restaurants by David Allen. Bookmark the permalink. Hey, David! Don’t know if you are aware, but the Burger King on Indian Hill in Pomona has been boarded up! Don’t know why. Also, the Quizno’s in Claremont on Bonita has gone belly up. Didn’t know about BK. Thanks, David. And Quizno’s were everywhere at one point. Subway seems to be doing better than ever. I am so putting this place on my list, I love soul food! !